The Calvin Klein Spring 2019 show's hair and makeup looks took a cue from the New York City weather this week, debuting clean beauty looks that made it seem as though the models had just casually been caught in the rain — much like many of the shows' attendees had battled for the week of presentations and appointments. With Jaws-branded graphic tanks and tees on many of the models, it was, in fact, more of a seaside ocean spray than a shower from the heavens, but that didn't stop it from being more relatable than ever this past rainy week. The dampened hair, created by stylist Guido, features fairly dry scalps and more wet ends, suggesting the models might have only just taken a dip in the sea, not yet been fully immersed. With most of the strands of their hair pulled back away from their face into a loose ponytail or bun, the rest hung loose and damp. 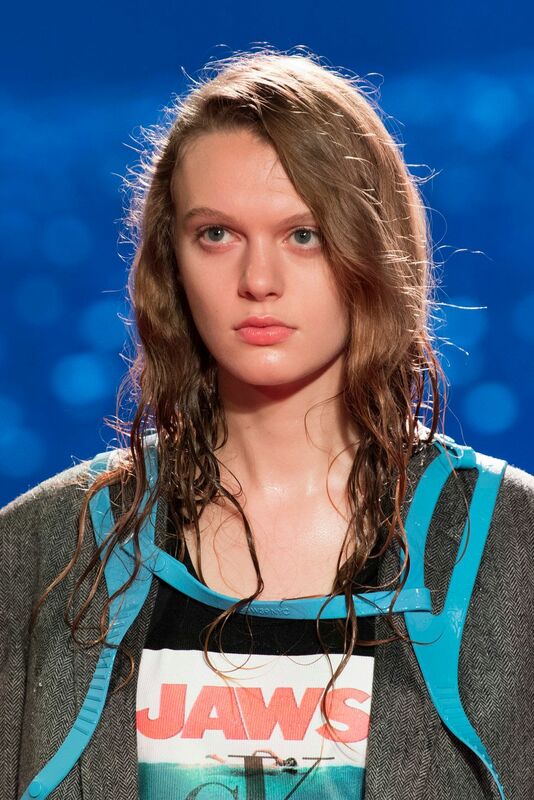 As it turns out, getting stuck in a rainstorm might just become the most fashionable trend in beauty this season. The makeup, also clean and fresh, had each model with a dewey face and natural glow that stripped away some of the more eye-catching, caked on makeup trends that tend to fill the runways during Fashion Week. It was a look created by none other than Pat McGrath. With just a little high-cheekbone color and a natural balmy lip, Calvin Klein put forth a collection of beauty looks that reminded us how much we love classic Americana.